The police pull over a man who they suspect has been drinking. He keeps asking if they found the girl. The next day, Benny is approached by a father at the church. The church needs his help. A Father was arrested for a DUI. Benny talks to Bull who isn’t thrilled about taking on the case of Father Andy who went out drunk to find a woman who was struck by the church’s van. Andy won’t talk because he cannot violate a confession he took from the person who hit her. Bull and Benny meet with Andy who won’t budge. He is determined to keep the driver’s identity private. Bull tries hard tp get him to change his mind. Even though he won’t, they are still going to represent him. At court, Benny and Bull talk. They need jurors that understand vows and not necessarily churchgoers. Meanwhile, Danny goes to talk to a woman who works at the church. She notices the woman keeps the code to the safe on the desk. In court, a police officer tells the jury that Father Andy was pulled over for drinking before but he wasn’t arrested because the officer felt bad for him. He brought him back to the church. 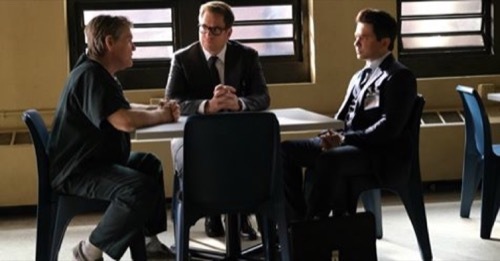 Bull and the team loses some potential jurors on their side. On recess, Bull and Benny tell the father he needs to tell the court about his run-in with the officer to clear the air. The father tells them he was at a wedding and when he was stopped later he was changing a tire. Chunk preps him later in a mock trial. The father admits that he drinks on occasion in front of his people because it makes them relax. Chunk tells him to own up to his mistakes on the stand. He gets upset and raises his voice. The father asks him if he is against organized religion. Chunk tells him that it is against him, referring to his homosexuality. Chunk is Baptist and used to go regularly. The father tells him he shouldn’t give up on God because the church people may have made him feel bad. Danny tells the team how anyone could have stolen the van keys out of the safe. They do some digging and use the van GPS to get a record of its routes. On the stand, the father tells the juror about his wrongdoings and discusses the night of the incident. He cannot share who hit the woman but he tried to help her. The prosecutor gets Benny on a loophole and asks the father to answer who was driving the van. Father Andy refuses and is held in contempt. The Monsignor meets with Bull and Benny. He is angry that the church is being dragged through the mud. They are going to walk away from the case and let Father Andy deal on his own. Bull is angry. How could they leave the Father behind and not support him? Bull tells the Monsignor he took a pledge to help the father and that is what they are going to do. Danny tracks down an address to a girl who had the van parked outside her house. Danny discovers that she is friends with one of the kids who is a member of the church has been driving the van. He is headed to Harvard and is a straight-A student. Back at the office, Danny tells them what she has learned. He is most likely the suspect. They decide they need to get him to talk. Bull tracks down the teen boy who was driving and talks to him about what will happen to the father. Later, the boy takes the stand. He hit the woman while reading a text. He cries on the stand. The prosecutor drops the charges against Father Andy. Outside the court, Bull tells the father they will get the boy a deal. The father isn’t sure how this is all going to work out and what God’s plan is, but he has one.